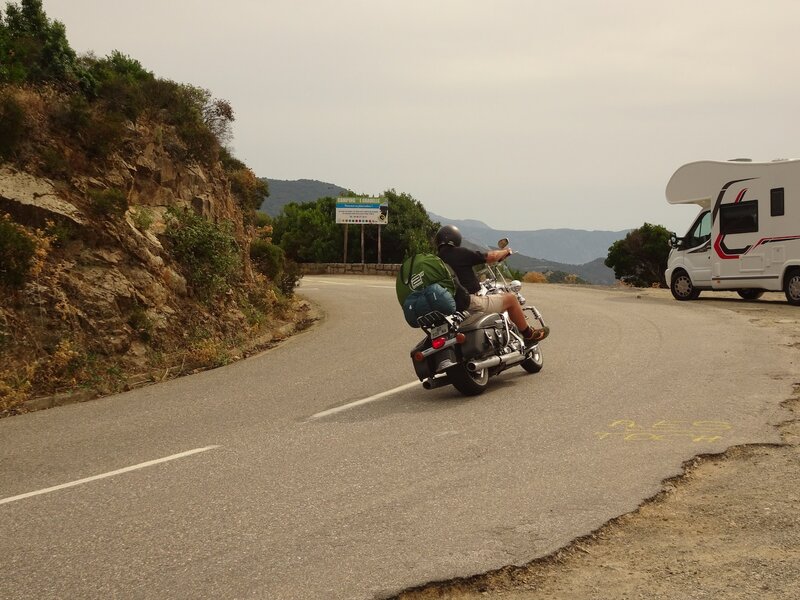 The crossing to Bonifacio on Corsica from Sardinia takes about an hour. 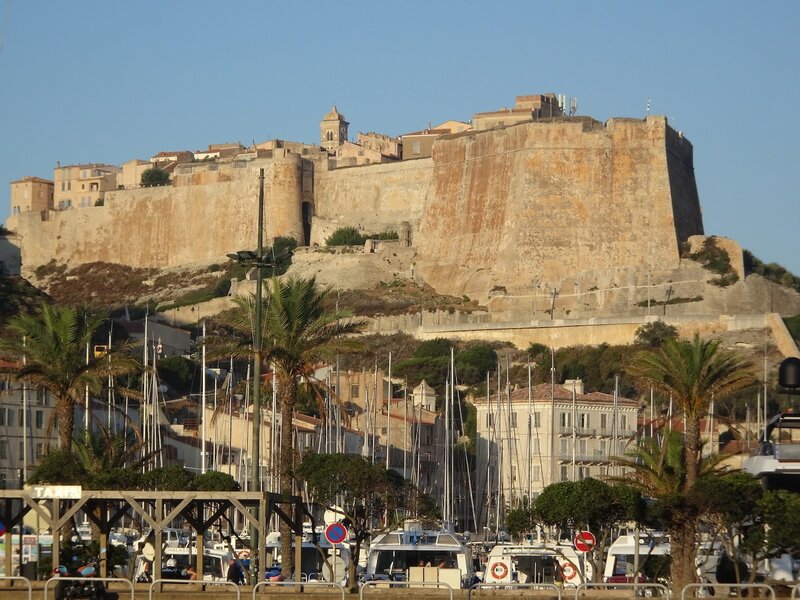 The entrance to the harbour is spectacular, the old town sits on a steep cliff high above the sea and the harbour entrance is only visible when you are close to it. Early I pack up my belongings and load my machine. 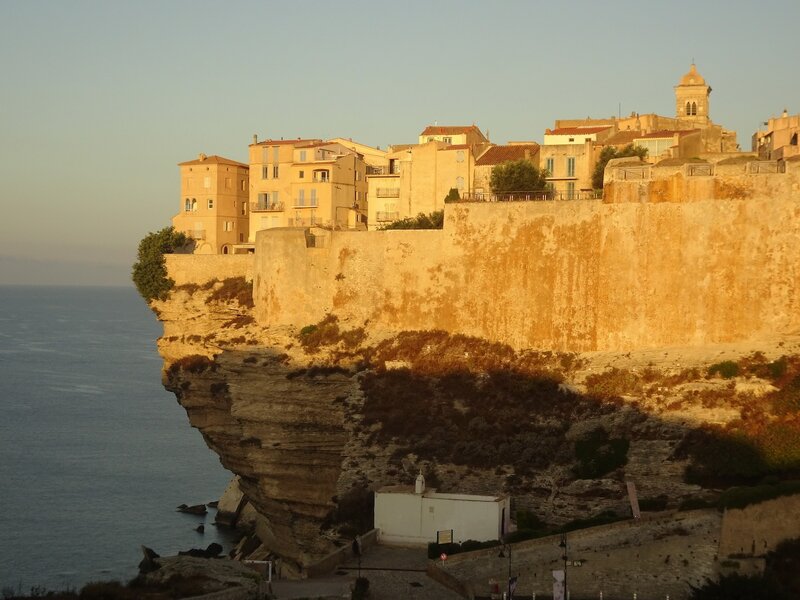 Shortly after sunrise I stand on the ridge in front of the town of Bonifacio. I look at the sunrise and the city beautifully illuminated by the morning sun. The view wanders over the cliff and the sea to Sardinia. Soon I start my journey: First stop needs to be at a ‘Boulangerie artisanale’. Here you can get the fine French baked goods and a coffee. Together with numerous commuters I sit at the road and enjoy my ‘Viennoiserien’ – raisin rolls and chocolate croissants. On a highway I reach Porto Torres. 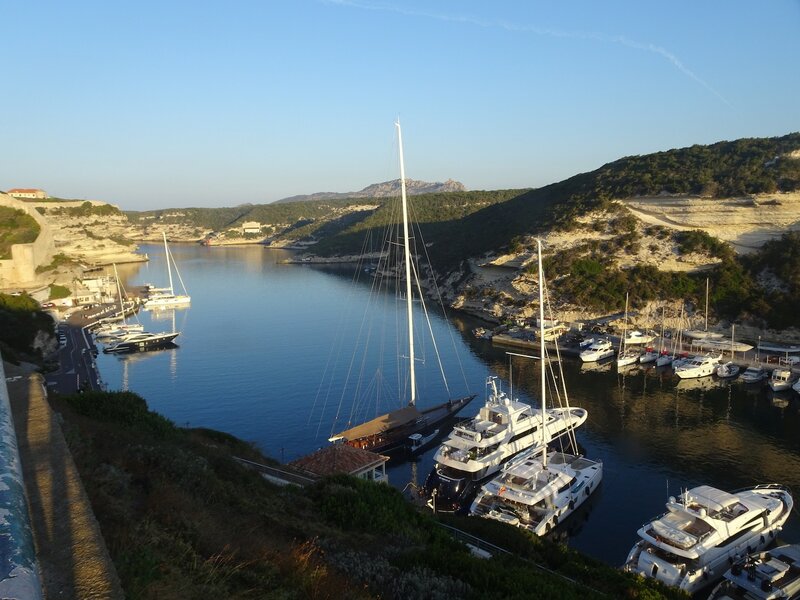 In the harbour there are numerous offers for boat trips along the coast or to the Costa Smeralda. Even more numerous are the big yachts. At the jetties at the beach, the smaller boats swing, on the outer ones, the big ships are placed. Up in the small town I am shown through narrow alleys, I don’t find the expected view of the harbour and the coast. On winding roads I drive to the coast. Here are many small bathing resorts with sandy beaches between pine forests. The season is coming to an end and there are only a few bathers left. On a side road I try to reach the ‘Bocca di Palza’. After almost 15 km I stand in front of a barrier, so I have to turn back – back the way again and up to the pass on the normal way. Between camper vans, slow cars and cyclists, I torture myself up the mountain. 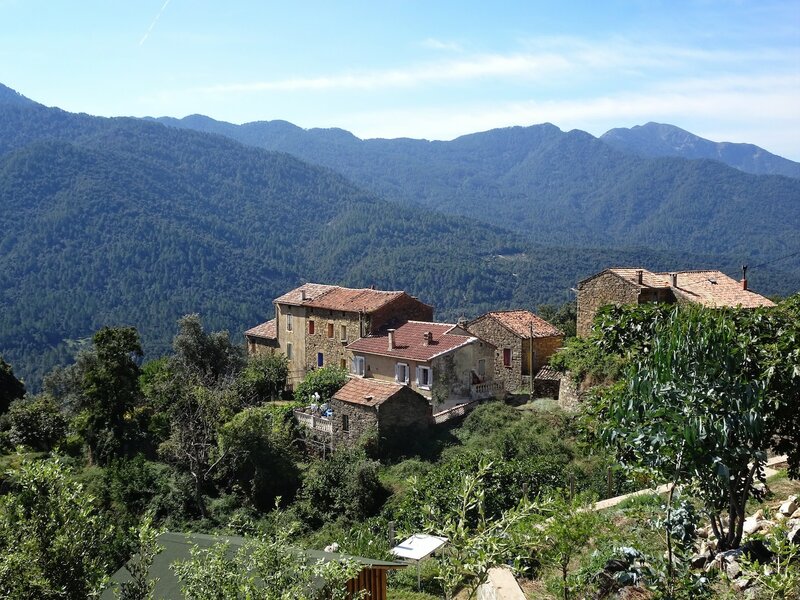 The village l’Ospedale nestles against the mountain slope and shortly behind it, a vantage point offers a view to the sea. Shortly behind the top of the pass lies the Lago d’Ospedale. Then the path leads through a light forest down to Zonza. Here, paths have been built into the forest to fight fires and large water tanks are available for the fire brigade. Zonza is a meeting point for tourists. 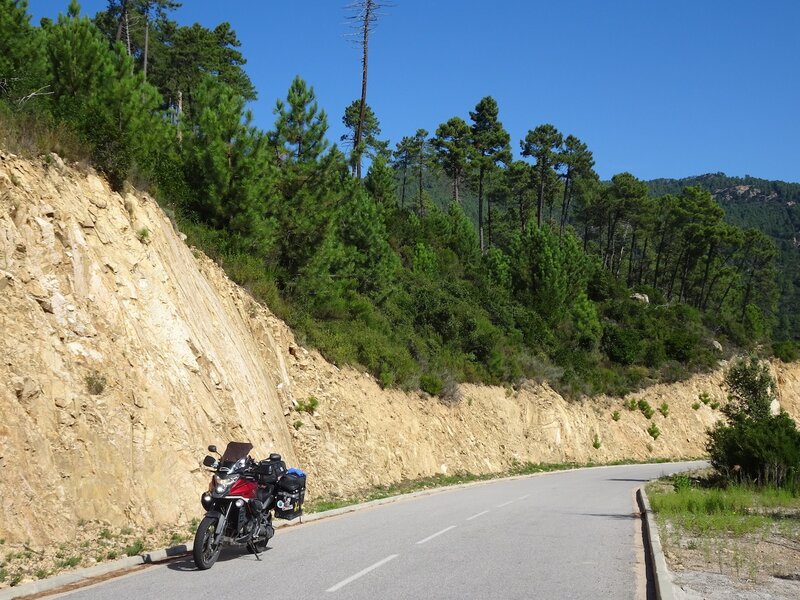 In the small place the motorcyclists rest, it is bought, eaten, drunk coffee and strolled. 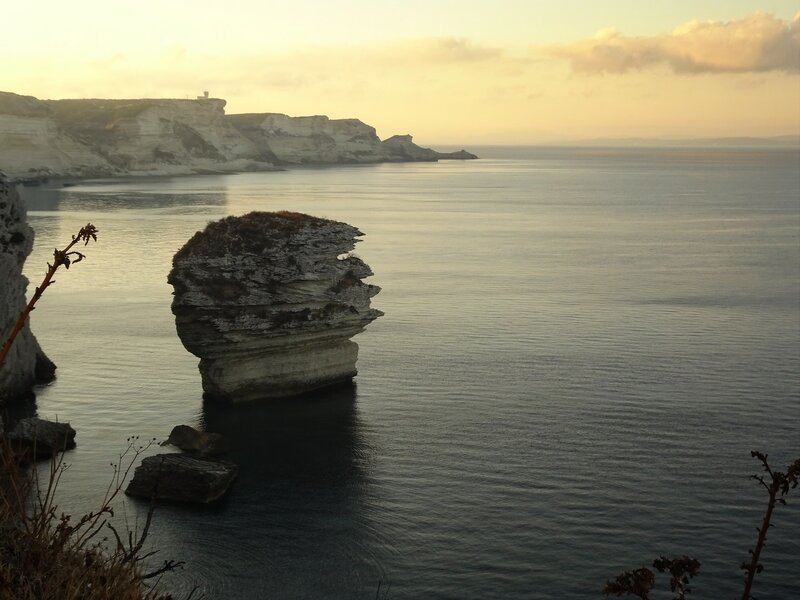 I turn to the east and drive along a narrow road to Quenza, Zoza and finally to the sea to Propriano. Here I take a short break and take some photos of the city. The way out of the city is not so easy to find and I turn one or two laps until I have made it. Then I follow the coastal road to Abbartello. I drive further along the coast and look for a camping site for the night. At sunrise I start to pack. As first goal I set myself a gas station. It should still be enough to Petreto. On a small, narrow and winding road I reach the village. Right next to the gas station there is also a café. Here, in the sun, I enjoy my breakfast and watch the hustle and bustle in the village. Then I follow the wide N-198 to Cauro. I turn onto the road to Bestelica. There follow smaller passes, the Bocca S. Alberto, the Col di Crichela and the Col die Menta until I reach the winter sports resort Bestelica. The small village is not very busy but picturesque. I get some groceries from the area and take some pictures of the village and we go on. After a few meters there are some pigs on the roadside. They enjoy the sun and hardly move. The road quickly gains height and soon I reach the pass summit. There is a fantastic view of the surrounding mountains. 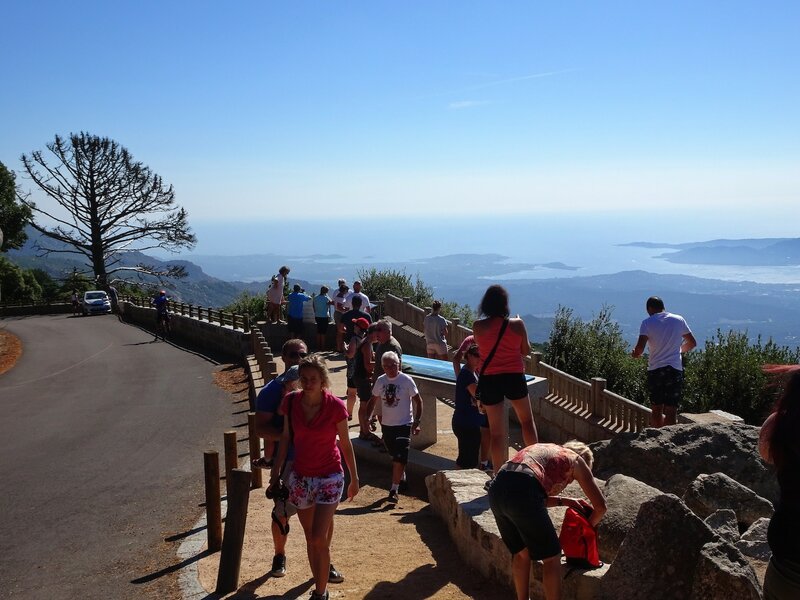 The descent to Tavera is impressive. It leads with few curves through a steep slope. For a short distance I use the N-193 to the west and then look for a way into the mountains again. A narrow road leads me to Vero, Azzaria and Rosazia. The villages nestle close to the steep slope high above the Crazzini valley. From time to time the view widens to the sea. 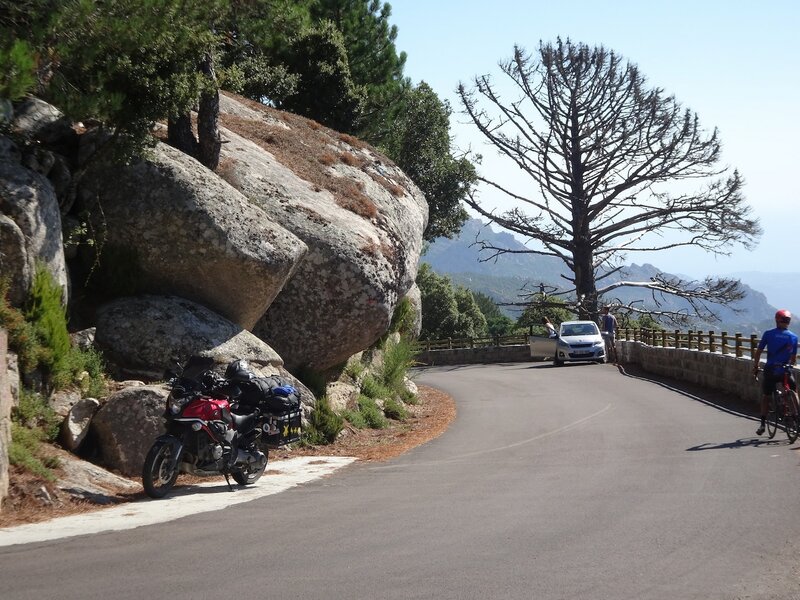 Shortly after Rosazia the road winds along steep rocks. Under partly overhanging rocks it gets narrow when crossing with cars. Fortunately there is hardly any traffic. In Vico I reach wider roads again and turn to the north. The area of Marignana is known for the chestnut woods and many farmers offer products made of chestnuts. There are fruits, flour or honey. I stay on the left side of the Arrone valley. 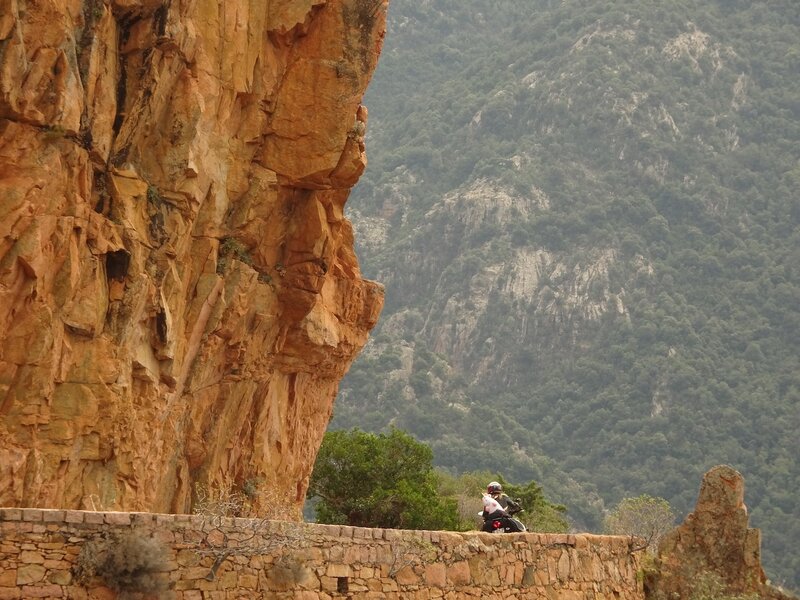 Shortly before Porto it forms a deep, rugged gorge with colourful rocks. Cows, goats and pigs cavort on the road. Before I reach the city, I cross the river and find myself in the narrow, exposed curves of the coastal road. A stretch follows through the hills of the Filosorma. It often winds through small villages, along bays and viewpoints. In Galeria I decide for the longer way, along the coast. The road is often patched, wavy and restless, but the views to the sea are wonderful. I literally leave the town of Calvi on the left and continue to follow the coast until I find a campsite near Isola Rossa. First of all the way leads me to Belgodere. Here, on the village square is the ‘Café de la Paix’ and not far from it, a little hidden, the rustic village bakery in a vaulted cellar. I order a ‘Café au lait’ and get a ‘Croissant’ from the baker and a ‘Pain aux rosines’, my usual breakfast. The local craftsmen and tradesmen sit in the coffee. The place in front of the coffee is covered by cars. They are standing all over the place, at and on the crossroads, but nobody is bothered by it. After a short time I drive uphill again from the village. On a steep slope lies the local cemetery around a church ruin. Two small passes follow, the ‘u Pruntu’ and the ‘Bocca de Capanna’. Although I drove hardly a dozen kilometres, I am already at almost 1000 m.a.s.l. Here the traces of a past forest fire are still good to see. I overlook the junction to Piana on the pass summit – it is also an inconspicuous crossing. Only after a few kilometres through the barren landscape do I notice that I am driving wrong. So I turn around and drive back, now the turn-off is obvious and I follow the right road. It leads me through a wild landscape with pastures and dry forests back into the valley. It goes past ruins of abandoned farms, pastures and valleys. From time to time there is a small herd of cattle on the road. I feel a little queasy when I have to drive past the mighty bull and his family. Such a good half a ton of meat makes an impression! Especially when there is no fence in between. After a short time I reach Ponte Leccia. I reorient myself and decide to drive through the mountains of Castagniccia to the east coast. The road to Morosaglia is almost deserted and offers wonderful views. The roads get narrower and narrower, the villages smaller and more deserted. There is not much going on here! The descent leads through dark brook ravines and gorges and it takes a good while until I reach a main road again in S. Pancrazio. East of the Stagno di Bigulia there is a narrow strip of land between sea and coast – that’s where I want to go. Unfortunately the reed grows so high on both sides of the road that I can’t see the sea. In a small ‘Salon de Thé’ in La Marana I take a lunch break. On the way to Bastia I find a place where I can look at the beach. 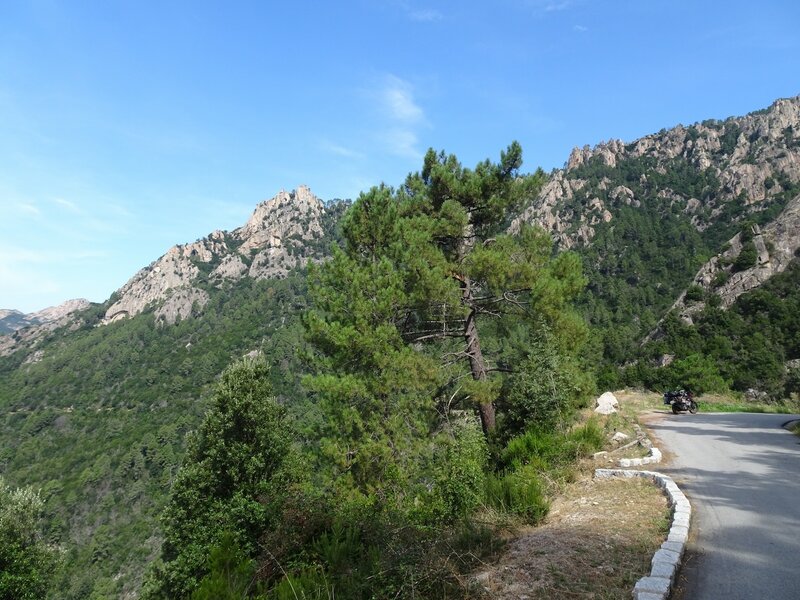 Shortly after entering Bastia, the road turns off to the ‘Col di Teghime’. Up here, at the battle monument, I see over the whole isthmus. On the east side I look at the Stagno di Bigulio and the sea before Bastia, on the other side the Golfo shines the S. Fiorenzo. 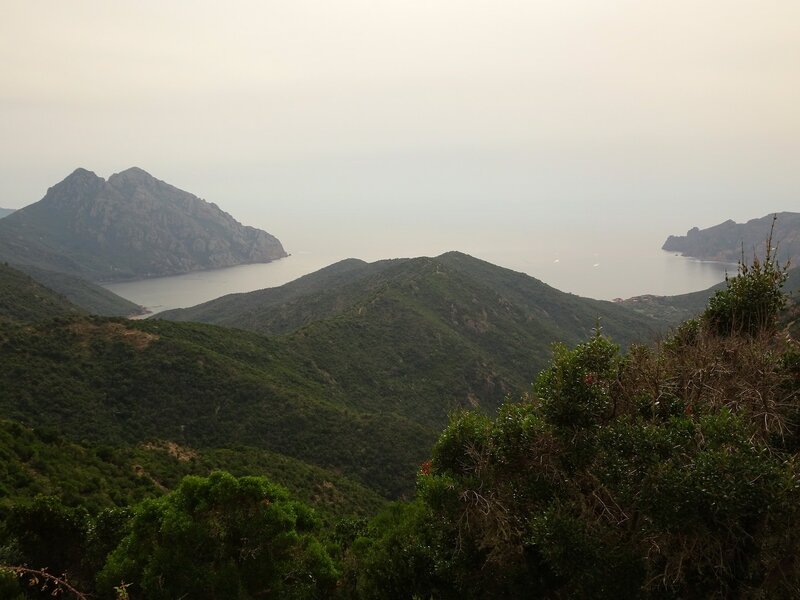 Descending to the west side of Capo Corse, the view opens onto the vineyards of the plain of San Fiorenzo. In Patrimonio I leave the main road and follow the road half way up to Braccolaccia. This is also another mountain village that nestles against the steep slopes. Soon I reach the busy coastal road and cross the picturesque villages of Nonza and Albo. 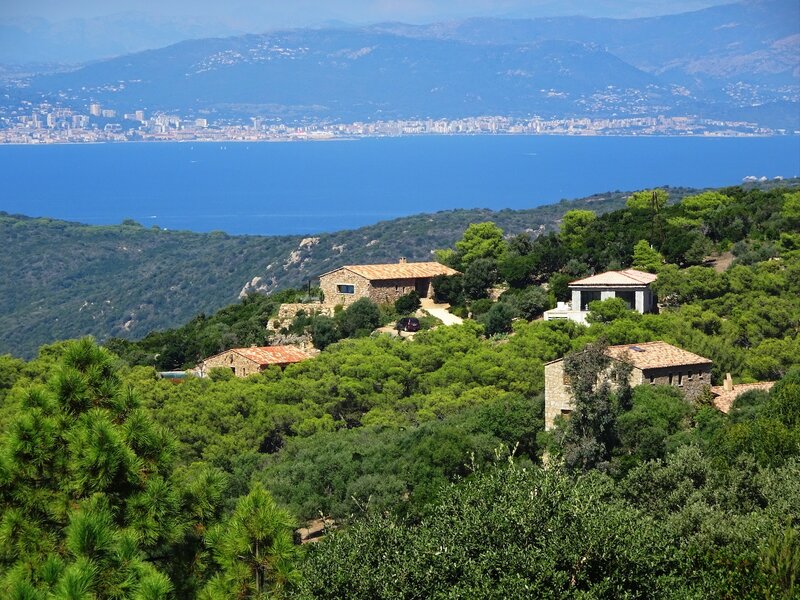 At the road, views to the sea and beaches alternate with narrow passages between the rocks. At the northernmost point are the windmills of Centuri. Unfortunately, only the towers are preserved; I am a little disappointed. But the view to the offshore island Giralia with its lighthouse compensates me. 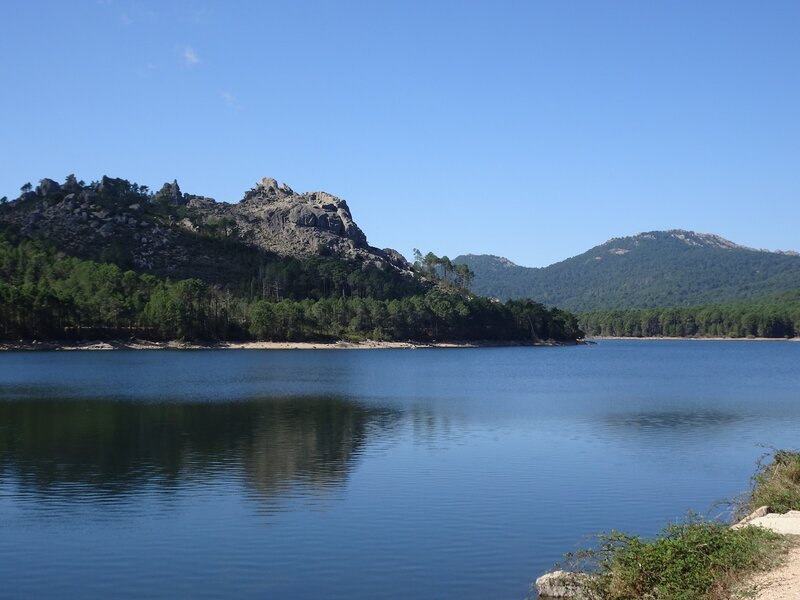 After a short drive I reach the next camping site in Marina de Luri. Already at sunrise I wake up and soon start to take down my tent. Since today I only have the short trip to the port of Bastia in front of me, there is enough time for me to arrange my belongings. Then I pack from scratch and am ready to go. As I want to start, my motorcycle does not move. The battery is dead. Yesterday evening I let the light burn a little too long. My starting device also has too little puff, so I am dependent on outside help. But first we have breakfast at the camping landlord. He is ready and able to bridge the motorcycle and shortly afterwards I leave the place. Along the sea I still find some worth seeing corners that I photograph: here a watchtower over a bay, there the harbour of a small village or a ship outside in the morning backlight on the sea. Only – for the time being I do not stop the engine and charge the battery. 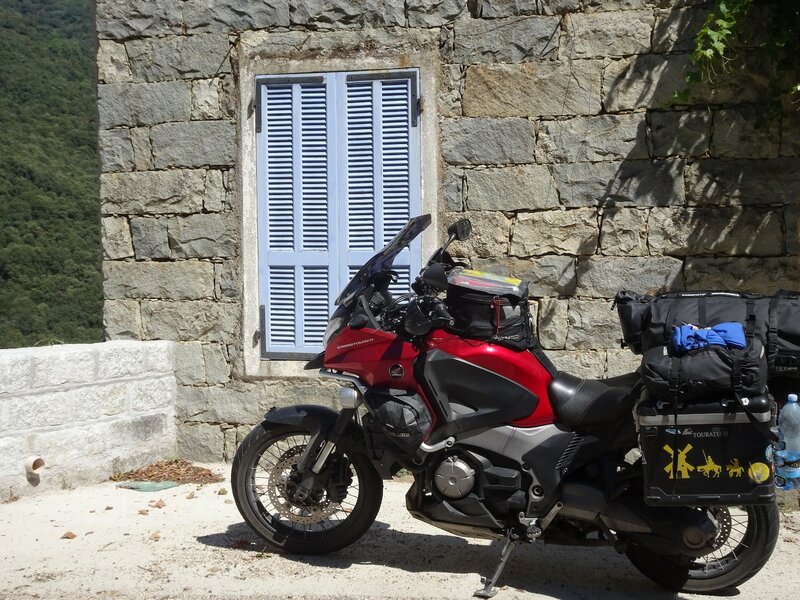 Shortly before Bastia I drive to a gas station. 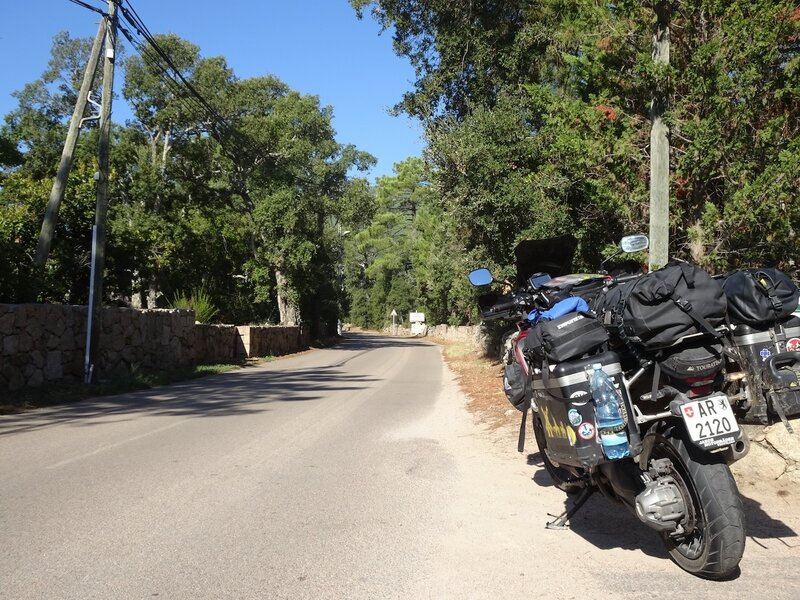 Since I will arrive in Nice only after spending the night, I fill up with gas and check the air pressure of the tires. Then I get some food for the seven hour crossing. In front of the ferry the motorcyclists gather as usual at the front of the column and we wait together for loading. The two hours pass by and soon we and our vehicles disappear into the belly of the ship and shortly afterwards the ship leaves the harbour. 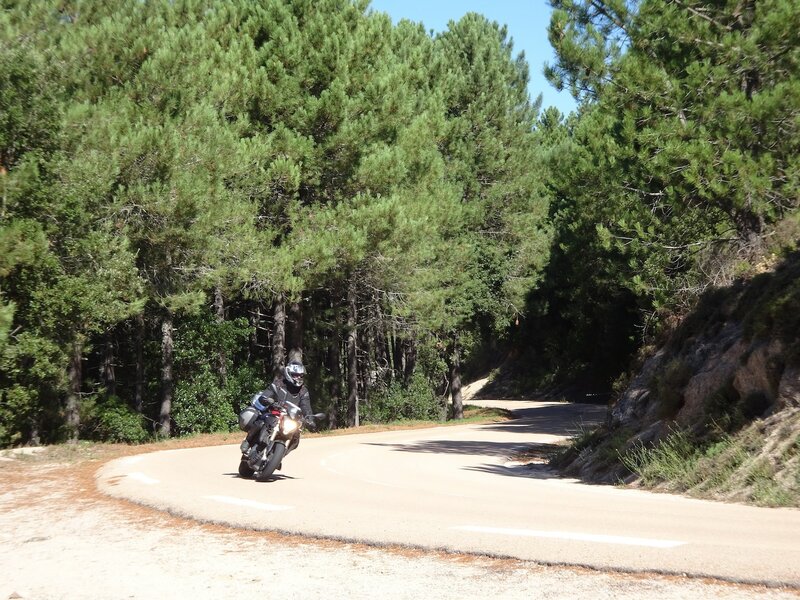 To explore Sardinia and Corsica by motorcycle was a special experience, from winding pass roads to epically beautiful beaches and coastal sections, these two islands have everything a motorcyclist could wish for. Recommended, try it too!